Providence Place Holiday Cottage is in the centre of Martham, a well serviced village on the northern reaches of the Norfolk Broads. The river Thurne is just one mile away where you can hire day boats and explore a relatively quiet area of this fabulous wetland habitat. Martham is an historical settlement atop a hill - its large church, St Mary's being a point on the horizon for many miles. The Saxons settled here in around AD600 and made Martham the capital of the Fleggs. These were once a group of islands around the area with Fleggborough Village remaining a few miles away. The village name derived from "ham of the Martens". Martens were small polecat creatures that once inhabited the landscape but last seen over a century ago. Martham is an ideal location for your holiday. Just one mile away you have the river network of the Norfolk Broads. Three miles north and you have access to fabulous sandy beaches at Winterton, Waxham and Horsey where you can regularly see seals. If you prefer the hubbub of popular coastal resorts, Great Yarmouth (Britain's second most popular seaside resort) is just 9 miles away with Hemsby being just three miles. If you're into nature or Bird Watching, Martham is a perfect base for your holiday. Only a short walk away is Martham Broad where Swallowtail Butterflies can be seen during season and a few miles distant are the nature reserves of Hickling and Horsey where you may even see a Bittern, one of England's rarest and most secretive of birds. Take the coast road west and you'll soon stumble across Horsey Windpump, a restored windmill owned by the National Trust. During spring and summer, this wonderful building is open to the public. 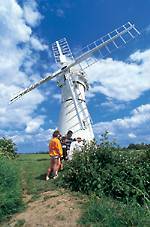 Just seven miles west on the A149 is the Broadland village of Stalham From here you can hire day boats and explore the river Ant or visit the Museum of the Broads to discover the history of the Broads National Park. Travel to Wroxham and you can visit Roy's the World's Largest Village Store and take a steam train ride on the Bure Valley Railway. This narrow gauge line runs from Wroxham to the market town of Aylsham. A few miles away from Aylsham is Blickling Hall, a fabulous jacobean house owned by the National Trust. The fine City of Norwich is just a 20 minute drive away from Martham. You could spend weeks exploring this historic city with its castle, cathedral and myriad of other attractions. There are many Park & Ride car parks on the outskirts of the city and these offer one of the best ways to get in and out of Norwich if you're new to the area.